This week, only one stat matters. 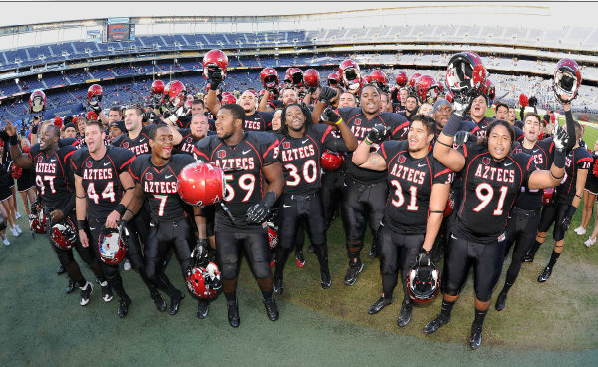 Since 2009, that is what has been said before every team meeting by the San Diego State football team. The coach asks two simple questions, the players give two simple responses. In school history, 18 conference championships have been won, and Aztec fans have been anxiously awaiting the 19th for years. SDSU controls its own destiny on Saturday, as they will finally have the chance to win their 19th conference championship when they take on Wyoming in their final Mountain West Conference game. If the Aztecs win, there are two other games that will determine whether or not the Mountain West Conference championship is shared or won outright. SDSU, Boise State, and Fresno State are all 6-1 in conference play, and each have one game remaining. Air Force vs. Fresno State – 12:30 p.m. pst on Saturday, Nov. 24 at Bulldog Stadium in Fresno, Calif.
Boise State vs. Nevada – TBA on Saturday, Dec. 1 at Mackay Stadium in Reno, Nev. If both Fresno State and Boise State lose their final conference games, SDSU will win the conference championship outright. Because there are no tiebreakers in the Mountain West, if either Fresno State or Boise State, or both, win their final games, it will be either a two-way or three-way tie for the conference championship. In 1998, led by head coach Ted Tollner, the Aztecs were co-champions of the Western Athletic Conference with a conference record of 7-1 and an overall record of 7-5. They tied with BYU and Air Force in the regular season, making the three teams co-champions in conference play. Air Force eventually went on to beat BYU in the conference championship game, but SDSU was technically still a co-champion in the regular season. The last time SDSU won a conference championship outright was in 1986, when quarterback Todd Santos led the Aztecs to a 7-1 record in the Western Athletic Conference and an 8-4 record overall. The season ended with a heartbreaking 39-38 loss to Iowa in the Holiday Bowl. This Saturday will determine if the Aztecs can secure their 19th conference championship, and the following Saturday could determine if it is won outright or shared.